P&O Ferries install MPM Hibernation system upgrade. 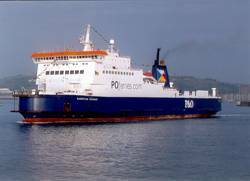 UK ferry operator P&O Ferries has recently taken delivery of Marine Software's MPM Hibernation upgrade for vessels "European Seaway" and "Pride of Dover" after deciding to put these vessels into lay-by. The MPM - Marine Planned Maintenance product was originally installed during a fleet wide software purchase in 2005 for 18 vessels, along with Marine Software's centralised Spare Parts, Procurement package and CODA finance system integration. This upgrade will ensure that all next due calendar based jobs not outstanding at the hibernation date will be suspended, as most machinery equipment will not be running during this period. For manned vessels during hibernation, planned maintenance job issue lists will only include those scheduled due jobs for actual running machinery, along with any outstanding jobs at hibernation. Once the vessel returns to service, the MPM system will automatically advance most calendar based PM job routines forward by the exact number of hibernated days. This re-schedule feature offers time savings to the crew, as they will not need to manually re-schedule all next due calendar dates into the future from the re-activation date. Not all calendar based PM jobs will be automatically hibernated, as the software has been specifically designed not to suspend Class Survey Jobs so these continue to remain active during the hibernation period. Some machinery will also still operate during hibernation e.g. Main Engines, Generators, Domestic Services, Compressors etc, should a skeleton crew remain on-board. These particular PM job cards will be switched into normal mode during hibernation because a requirement still exists to continue maintenance tasks on this running machinery. Other equipment that has specific expiry dates such as Liferaft annual servicing, Hydrostatic Release renewals, Pyrotechnics, Davit Wire replacements can also be switched to remain active during hibernation ensuring all expiry dates are strictly adhered to. Should a vessel go into an extended hibernation period such as a hot or cold Layup, additional job cards can be created for dedicated Layup type maintenance routines, for example: turning crankshafts, turbo-charger rotors and checking hanging anodes. This MPM Hibernation feature would also work well during future vessel refits, and P&O Ferries are currently deciding on upgrading all other fleet vessels.